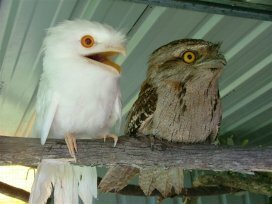 This unusual Albino Tawney Frogmouth sits next to a normal Tawny Frogmouth he has made friends with in the aviary. He was found on the ground in a caravan park in Byron Bay with people shooing him aside to get by! Spring is the maternity time for flying foxes. Orphaned flying foxes generally come into care in October and November. Their mothers may have died because of barbed wire or netting entanglement, or electrocution on power lines. Sometimes pups are found alone on power lines or on the ground. In the Northern Rivers we get black flying foxes and grey headed flying foxes. When they come into care, they are fed cows milk 4 or 5 times a day and gradually introduced to fruit. They bond quite strongly with their human carers. At 10-12 weeks of age, they become fully weaned and enjoy a fruit diet. This is also when they start to fly. They are then sent to bat creche for a few weeks before being transferred to a release aviary. They do not miss their human careJanuary 19, 2014 are released from the aviary after a few weeks and are support fed there for a few months after their release. 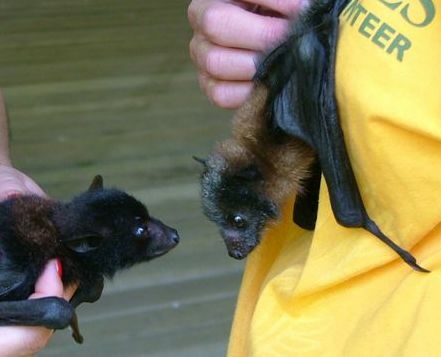 This picture shows a black flying fox pup, Robby, on the left and a grey headed flying fox pup, Francie, on the right. Robby was found alone on the ground in Casino and Francie came from Legume where her mum was found electrocuted. Spring is the time when most birds are breeding, unfortunately many juvenile birds be come orphaned for a variety of reasons, from parent birds being killed, juveniles falling out of nests due to high winds, or simply just falling out, the nest being too high for us to get them back up, the reason can be as varied as the species we deal with. 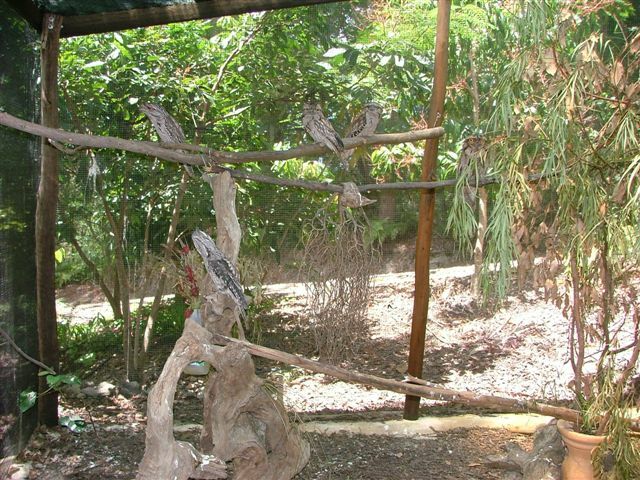 In all cases WIRES try to locate the juveniles in groups, as seen here a group of juvenile Tawny Frogmouth birds growing up together in WIRES carer Alicia's aviary. All will be released back to the wild when ready to take care of them selves. This little Bandicoot came in to care after being found by pupils from St Johns school in Mullumbimby. 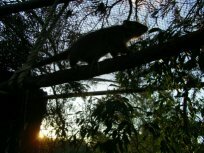 2 Bandicoots were found alive another dead from unknown cause. The one seen here has done well in care, her sister unfortunately did not fare as well and died after only a few days in care. They were rescued by WIRES carer Georgie, spent their next stage in care with carer Margi before finally this little female has gone to her release site where she will learn all about foraging for food, finding the right hiding places and being a wild Bandicoot. Thank you to the pupils of St Johns, it is due to your vigilance this little female will have a second chance at life in the wild. 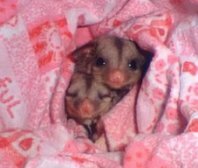 Two juvenile Ringtail possums arrived in to care only a we ek apart in May, both were victims of tree felling on private properties. They are seen here 9 weeks later still in care with WIRES carer Julia. They are now fairly independent, and the time for release is getting closer. WIRES receive regular rescue calls for Wedge-tailed Eagles . The Wedge-tailed Eagle is Australia’s largest bird of prey, with a wingspan of up to 2.5 meters, and 1metre long from beak to tail. Eagle numbers have plummeted since white settlement due to the mistaken belief they preyed on lambs. Until recently they were shot, poisoned and trapped in the hundreds of thousands. During the 1960’s, 30,000 eagles were killed each year. Thankfully, Wedge-tailed Eagles are now protected and it is illegal to harm them in any way. Unfortunately they still have an uphill battle for survival. The problems facing them today are habitat destruction, poisoning from baits, reduced numbers of rabbits, and road accidents. 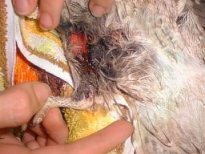 Some people still attempt to shoot them, and recently lead shot was revealed in an x-ray of an eagle with a broken wing. As eagles are carrion feeders, they are drawn to road-kills. If you ever see an eagle feeding on the side of the road, slow down! The eagles are heavy birds and it is surprising how slow they are to take flight. Often they fly across the traffic and into the path of a car. Another way to help reduce accidents is to remove dead animals from the roadside, but only if it is safe to do so. Remember to always check the pouches of marsupials for live young. 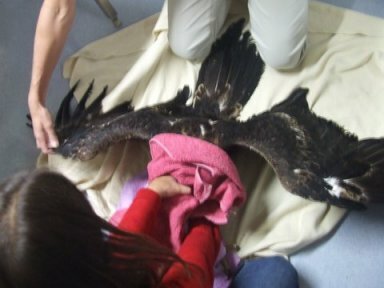 If you do ever find an injured eagle, or any other native wildlife in distress, calls WIRES immediately on 66281898 and if possible stay with the bird/ animal until a trained rescuer arrives. Do not attempt rescue of eagles on your own, as they can be dangerous, especially their impressive talons. It would be a tragedy to lose these magnificent birds from our skies. 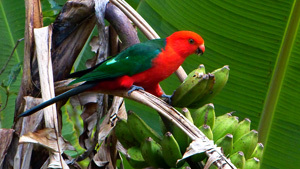 Native animals c an get in to trouble for many different reasons. 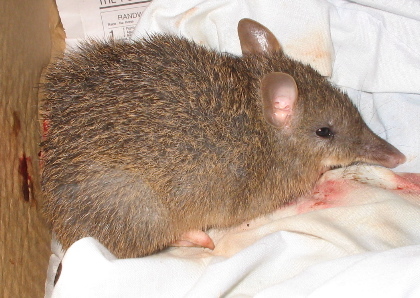 This Northern Brown Bandicoot was injured when a member of the public was mowing the lawn. 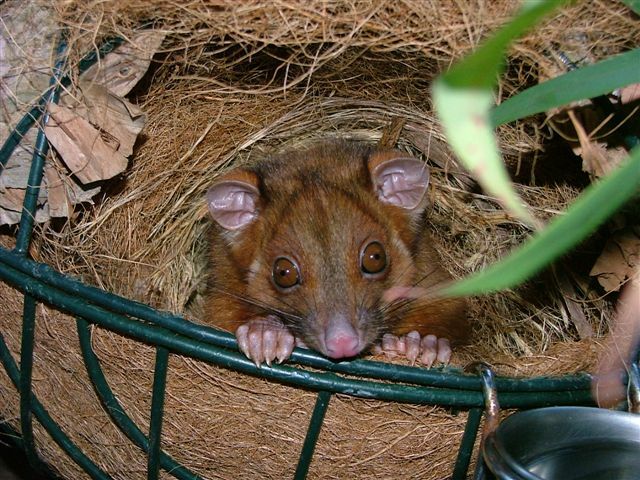 Bandicoots will hide under a mulch pile, so having a quick check before mowing may prevent such an injury. WIRES carer Roger rescued and cared for this juvenile male Bandicoot, after veterinary treatment and a few days in Rogers care, he was once again released back to where he was found at Lennox Head. 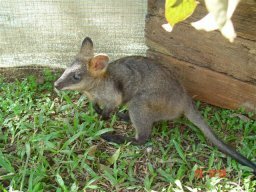 WIRES macropod carer Katy received this Swamp wallaby joey in to care in February 2006 from Rebecca of Brunswick Heads, she found this joey having been injured in a car accident. 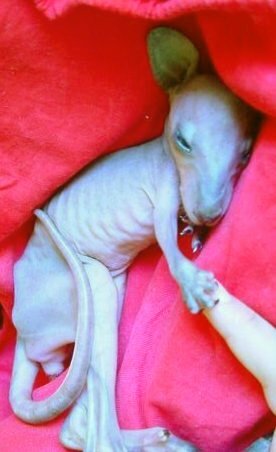 The joey was very small when she arrived in to care, she did not even have fur. First image taken the day of her arrival, and second image after 4 months in Katy's care. Thank you Rebecca for rescuing this tiny wallaby. Thank you Rebecca for rescuing this tiny wallaby, Kangaroocia as she was named is now almost ready for release back to the wild. This Mountain Brushtail joey was found in his dead mothers pouch by Robyn on her morning walk at Alstonville. How lucky can a little possum be when he finds himself in the unfortunate situation of being orphaned, to be found by the partner of a veterinary surgeon. Dee as he was named ( due to being found in Dee's Lane) was taken to Alstonville Veterinary Clinic, where he was examined and found to be in excellent health considering his ordeal. 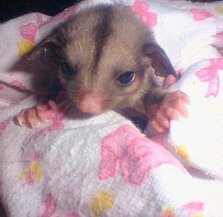 He was put on a heat mat to keep him warm till WIRES rescuer Jessica arrived to take him to WIRES possum carer Kristin. Here he has thrived and grown, and he is now almost ready to be paired up with yet another orphaned Mountain Brushtail possum, same age as Dee. They will grow up together and as long as all goes well, will be released together when ready. Thank you to Robyn and the Lennox Head Veterinary clinic. T his is for Geoff. Thank you Geoff for stopping and checking the pouch of the dead mother of this very young Pademelon joey. He is doing well in care, and after 3 weeks in care is starting to grow some fur. He was about 3.5 months old when found, and he will stay in care untill he is mature enough to survive in the wild at about 10 months old. Four Magpie Lark chicks were found on the ground by four boys. Being the perfect number they each t ook one home. The youngest chick did not survive long term, but the other 3 were successfully released with a group of other Magpie Larks. 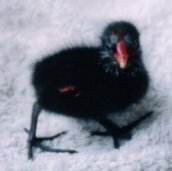 This Dusk y Moorhen chick is lucky to be alive after it was taken from its family by some boys who unfortunately threw it around for a while before abandoning in the main street in Casino. A member of the public, Sarah, rescued the little chick and called WIRES. Gordon and Monica of Wyreema Animal Nursery kindly donated a Bantam chick as a buddy, and the two became firm friends. The Moorhen grew well, and after 6 weeks in care was released at the Richmond River in Casino. The bantam was returned to its family at Wyreema. To see this little chick grow, click here. Kookaburra chicks are reunited with their parents. A member of the public brought me the first of 3 Kookaburra nestling after he had fallen from his nest hollow near the racecourse at Casino. The tree was tall, spindly and full of white ants. He weighed 278 grams and was covered in the largest pin feathers I had ever seen! Three days later his sibling also fell (288 grams) and then a third who unfortunately didn't’t survive the fall. I kept them in a substitute nest hollow made from a cardboard box and once they felt safe started to feed voraciously. The larger kookaburra was always more aggressive and ate more than his brother. After two weeks both left the nest and were perching well, even grabbing and banging their food. Then began the process of reuniting them with their parents. I took them to the racecourse in a large cage and hung it in a tree, then returned throughout the day to feed them. I brought them home at night for fear of predators trying to get them. The parents were around at times. After the forth day the parents were sitting on the cage and feeding the chicks through the wire, so I opened the cage. They were observed over the next few days sitting together high in a tree, with the parents around. We are having a nest box made and will attach it to a more suitable tree, so hopefully next breeding season their young will be safe. Click here to see them grow. 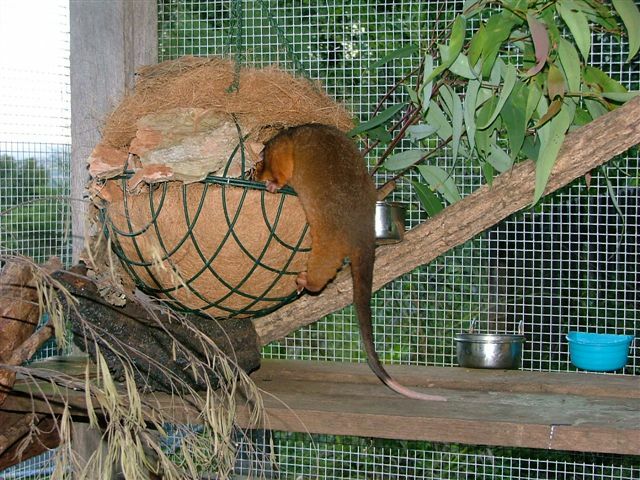 WIRES r ecieved a young Ringtail possum in to care quite some time ago, he was only little on arrival, but has thrived in care. He is seen here in the last stages in care. Thank you Carla for being vigilant and realising this animal was in trouble, without you he would not have had the chance of growing up, and return to the wild. An exha usted 4 month old female juvenile Platypus was washed from her home after the recent floods in Northern NSW last week. Thanks to the keen eyes of Jonathan & Nathan canoeing down the creek, the Platypus was rescued when they spotted her washed up on the bank. The boys immediately contacted WIRES and the intensive and specialised care of the Platypus ensued. 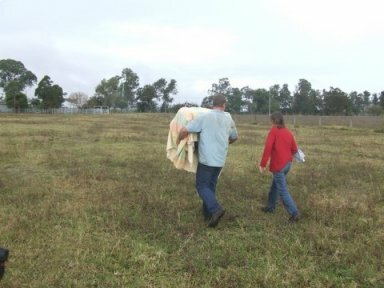 After a trip to the Currumbin Sanctuary Veterinary hospital where the Platypus was placed in intensive care and monitored by an expert in this species from Fleays Fauna Park, it was found that she was suffering from exhaustion. After 4 days it was time for her to go back to the wild, and she was brought back home by WIRES to the Northern Rivers. There were several crucial factors for WIRES to consider to ensure a successful release. A suitable location with a plentiful food supply and adequate protection needed to be found, and secondly this young female platypus was too young to dig her own burrow. An artificial burrow was constructed and she was released post haste into a cool creek pool where she can be closely monitored over the next month. Cat attacks unfortunately account for most Sugar Gliders coming in to care, this little male Glider is no exception. Fortunately WIRES was contacted as soon as possible by the owner of the cat, and we were able to treat him immediately on arrival. Time lost in cases like this is often detrimental to the Sugar Glider's chances of survival in cases of cat attacks due to the infection caused by th e claws and teeth. Even if we may not be able to see the penetration marks on the animal, it is almost certain to have been injured, and unless treated as fast as possible, has the potential to be a sad outcome. In this case we hope to have a good outcome, and our little male received a companion 5 days after arrival, a female Sugar Glider. Months can go by without any ducks coming into care. So it was surprising and fortunate to have recently received 3 separate duck calls within 24 hours. 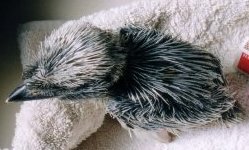 Firstly I collected a single day old Pacific Black duckling which WIRES carers Emma and Betsy picked up from Pimlico. I was just about to go out to collect a day old domestic duckling to buddy up with it, and a call came from W IRES carer Nicki in Byron Bay that she had just picked up a little duckling. Great. A native instead of a domestic buddy for the Pimlico duckling. I was just about to go and collect Nicki’s duckling when WIRES carer Danielle called to say there was a mother duck with 8 ducklings at Byron Bay Vet. Could we be lucky enough for these 3 situations to merge successfully? The vet said that the mother duck was unable to use her legs but couldn’t determine the cause. I put mother duck and all 10 ducklings into care. Mum immediately ushered all 10 under her body. The ducklings were all day old, all Pacific Blacks. Within another 24 hours, the duck was using her legs normally. I guessed that she had probably just been exhausted from prolonged nest sitting. After six days, I released mum and the 10 ducklings onto a large, vegetation lined dam in Ewingsdale. It was wonderful indeed to see mum step out of the cage and swim away to explore their new home, with the 10 little balls of fluff paddling behind her. The landowner will keep an eye on their progress.